This volume is both a companion to the editors' Greek Historical Inscriptions, 404-323 BC, and a successor to the later part of the Selection of Greek Historical Inscriptions to the End of the Fifth Century BC, edited by Russell Meiggs and David M.
Lewis and published in 1969. As with the editors' earlier collection, it seeks to make a selection of historically significant inscribed texts accessible to scholars and students of fifth-century Greekhistory. Since the publication of Meiggs and Lewis' collection, a number of significant new inscriptions and fragments have been unearthed and new interpretations of previously known examples developed. 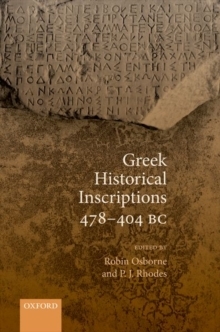 As well as updating the scholarly corpus, this volume aims to broaden the thematic range of inscriptions discussed and to include a greater selection of material from outside Athens, while still adhering to the intention of presenting texts which are important not just as typical of their genre but intheir own right. In doing so, it offers an entry point to all aspects of fifth-century history, from political and institutional, to social, economic, and religious, and in order to make the material as accessible as possible for a broad readership concerned with the study of these areas, the Greektexts are presented here alongside both English translations and incisive commentaries, which will be of utility both to the specialist academic and to those less familiar with the areas in question. The inclusion of photographs depicting inscribed stones and bronzes complements discussion of the inscriptions themselves and enables parallel consideration of their nature, appearance, and transmission history, resulting in a work of thoroughly comprehensive, cutting-edge scholarship and aninvaluable reference text for the study of fifth-century Greek history.